From left to right: illustrator Andre Sibayan, and authors Gayle Romasantan and Dr. Dawn Mabalon. 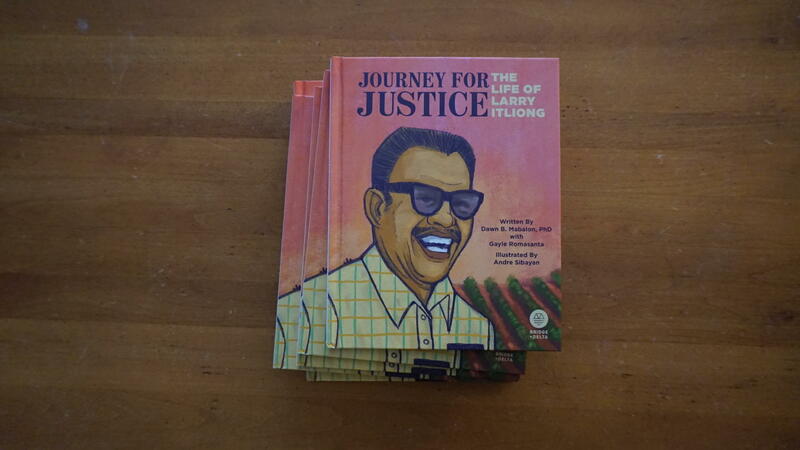 The three created the book, "Journey for Justice: The Life of Larry Itliong," to commemorate the work of Filipino activist and farm-laborer, Larry Itliong. Listen to this interview with author Gayle Romasanta here. When you think of civil rights leaders from the Central Valley, names like Cesar Chavez and Dolores Huerta probably come to mind, but another fundamental figure in the farm-labor movement was Larry Itliong. The Filipino activist co-founded the United Farm Workers of America and was pivotal in the Delano Grape Strike. His life was recently memorialized in a children’s book, “Journey For Justice: The Life of Larry Itliong," co-written by historian Dr. Dawn Bohulano Mabalon and Gayle Romasanta. The book was illustrated by Andre Sibayan. Listen to the interview above to hear one of the authors, Gayle Romasanta, discuss what it was like to write the first book recounting Larry Itliong’s impact in the Central Valley. The book’s tour kick-off begins this weekend, with events taking place in Delano Friday through Sunday. Details and information to RSVP can be found at the website of Bridge + Delta Publishing.